Second Run are releasing Pedro Costa's latest on a limited theatrical run in September. My fingers are crossed for a Cinema Guild Blu-ray release in the states, though. We'll be releasing HORSE MONEY in UK cinemas from September 18th. It will open at London's ICA cinema + other UK venues TBC on that date + screenings around the UK following on from that date. Here's a first teaser for the film. I was going to watch this at Toronto Film Festival last year, but there wasn't any screenings the days I was there. Man am I glad you picked this one up! 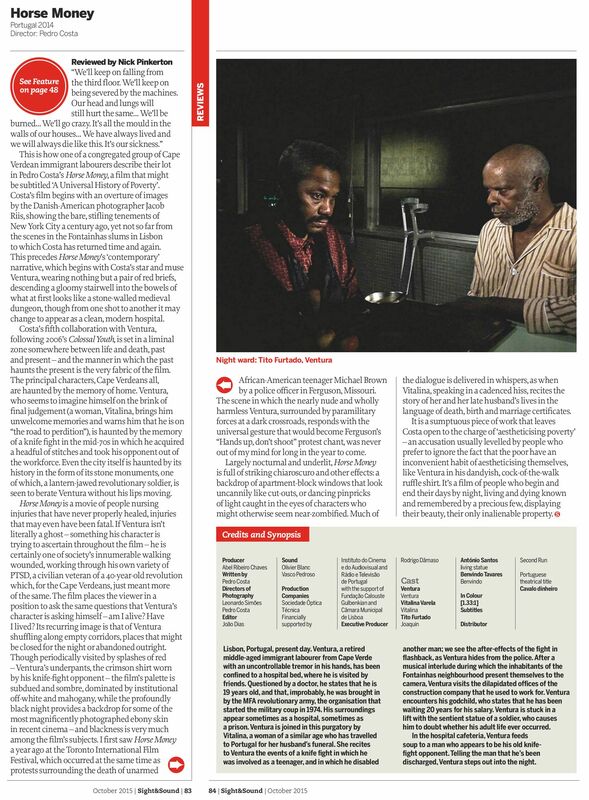 Little White Lies choose their '25 Films To Look Forward To In 2015' - including Pedro Costa's HORSE MONEY out September 18th. 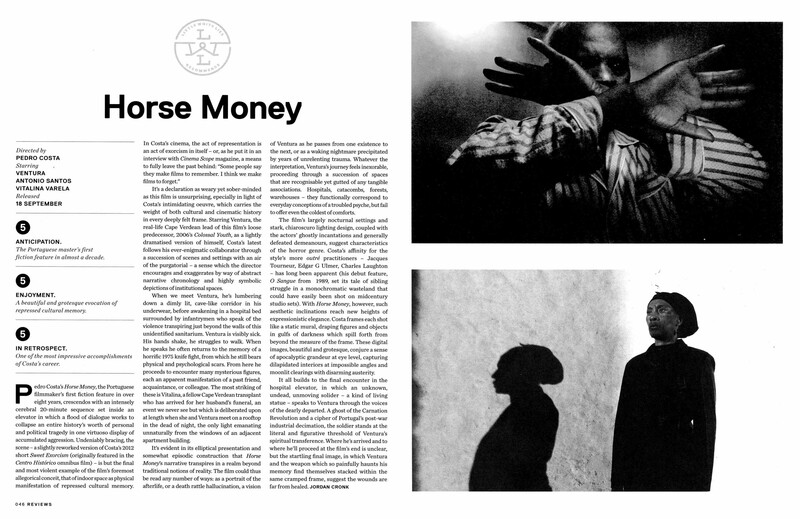 Tickets are now on sale for HORSE MONEY at ICA London from September 18!! Director Pedro Costa will be in attendance for a special Q&A with the screening on Friday September 18. Adding to it's roster of Awards and prizes, Pedro Costa's HORSE MONEY just won the consensus 'Best Film of the Festival' award at the Melbourne International Film Festival 2015 + Best Cinematography for Leonardo Simões (and Pedro Costa). Saw this + Q&A last night in Manchester. Could be one of my favourite films of the year so far. Astonishing. Will be at Showroom Sheffield from this Friday 25th! Bikey, can you tell us if this means we can expect more blu-rays from Second Run, or is this a one-off blu-ray situation since Horse Money was your first theatrical release? Second Run releases are the only DVDs I bother to pick up anymore, so I'd be thrilled to hear that you'll be releasing blu-rays from now on, if that's the case? Any chance older titles might be upgraded to blu-ray in the future? Fantastic. I promise to pre-order. Day one pre-order on my part, as well. I'm not a Costa fan (yet?) but I'll be picking this up to show support for this wonderful label finally branching out into Blu-ray! This is a day that I never thought would come. WOW. You guys were the missing link in the UK Blu-ray market (which I think we can all agree, is propped up immensely by boutique labels, moreso than any other Blu-ray market) and it will be great to own all your Blu-rays. I can only hope that this does surprisingly well for you, so that you can release (many) more. But anyway, this is ecstatic news. I feel bad for only having only bought 2 Second Run DVDs to date but I'm well aware that's my loss! I will definitely be supporting the move to Blu-ray, and hopefully this means some older titles will make the transition...though I'm happy if it's only your newer acquisitions as I'm aware it would be a costly exercise in most cases. That said, you could always attempt it with some of the more contemporary directors' work you've released before (Weerasethakul, Lanthimos, Alonso, Gomes etc), as I assume the materials are in a better condition and more easily off-the-shelf?